Short interstitials (1-2min), reviews of fiction and nonfiction titles by author Gerald Everett Jones. Each piece includes separate music bed file for adjusting to your show clock. Gerald Everett Jones pulls his favorite titles from the shelf and gives his witty advice on what to read next - including everything from timeless literary masterpieces to recent releases, from fanciful fiction to no-nonsense how-to books. Author of the historical novel Bonfire of the Vanderbilts and host of GetPublished! 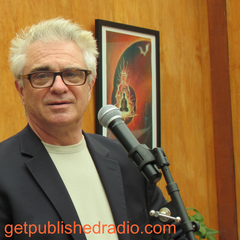 Radio, Gerald's book reviews have run locally in Los Angeles on KRLA-AM 870, Hella Radio KNNN-FM 87.7 Redding, and on his Boychik Lit podcast feeds. He also reviews for the ezine Splash Magazines Worldwide (LASplash.com) and Goodreads. Pieces are evergreen and short enough to incorporate in those hard-to-fill show gaps. The series library is 50+ pieces. Here's Gerald's audio book review of The Prague Cemetery by Umberto Eco about the roots of fascism in Europe. Here's Gerald's audio book review of My Voice Will Go With You: The Teaching Tales of Milton H. Erickson by Milton Erickson and Sidney Rosen. Here's Gerald's audio book review of Abandoned in Hell: The Fight for Vietnam's Firebase Kate by William Albracht and Marvin Wolf.